ESA's Rosetta Spacecraft Sent To Study A Comet. Rosetta is an ESA spacecraft mission to investigate comet Churyumov-Gerasimenko. Rosetta spacecraft is a European Space Agency-led robotic mission. Rosetta spacecraft was launched in 2004. Rosetta spacecraft is intended to study the comet 67P/Churyumov-Gerasimenko. Rosetta spacecraft consists of two main elements: the Rosetta space probe and the Philae lander. The probe is named after the Rosetta Stone, as it is hoped the mission will help unlock the secrets of how our solar system looked before planets formed. The lander is named after the Nile island Philae where an obelisk was found that helped decipher the Rosetta Stone. During the 1986 apparition of the Comet Halley, a number of international space probes were sent to explore the cometary system, most prominent among them being ESA's highly successful Giotto. After the probes returned a treasure-trove of valuable scientific information it was becoming obvious that follow-ons were needed that would shed more light on the complex cometary composition and resolve the newly opened questions. Both NASA and ESA started cooperatively developing new probes, the NASA led effort was the Comet Rendezvous Asteroid Flyby or CRAF mission, the follow-on Comet Nucleus Sample Return or CNSR mission was to be an ESA led effort, both missions were to share the common Mariner Mark II design, thus minimizing costs. In 1992, after NASA axed CRAF because of budgetary limitations, ESA decided on developing the spacecraft by themselves. By 1993 it was evident that the ambitious sample return mission was unfeasible with the existing ESA budget, so instead the mission was redesigned, with the final flight plan resembling the canceled CRAF mission, an asteroid flyby followed by a comet rendezvous with in-situ examination, including a lander. Rosetta was built in a clean room according to COSPAR rules, but "Sterilisation [was] generally not crucial since comets are usually regarded as objects where you can find prebiotic molecules, that is, molecules that are precursors of life, but not living microorganisms," according to Gerhard Schwehm, Rosetta's Project Scientist. It was set to be launched on January 12, 2003 to rendezvous with the comet 46P/Wirtanen in 2011. 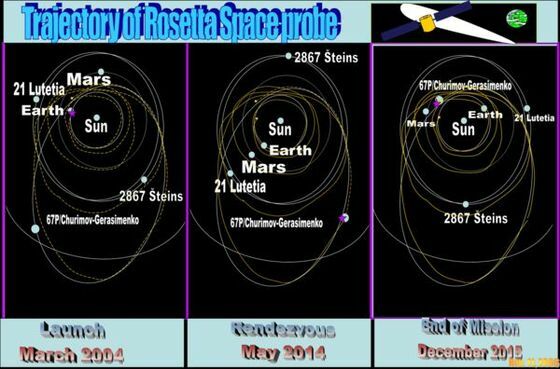 Trajectory of the Rosetta Space Probe. However this plan was abandoned after an Ariane 5 failure on December 11, 2002. A new plan was formed to target the comet 67P/Churyumov-Gerasimenko with launch on February 26, 2004 and rendezvous in 2014. The larger mass and the resulting increased impact velocity made modification of the landing gear necessary. After two cancelled launch attempts, Rosetta was launched on March 2, 2004 at 7:17 GMT. Besides the changes made to launch time and target, the mission profile remains almost identical. On 25 February 2007, the Rosetta craft was scheduled for a low-altitude bypass of Mars, as this was needed to correct the trajectory after the first lauch in 2003 was delayed by one year. This was not without risk, as the estimated altitude of the flyover manoeuvre was a mere 250 km (155 miles). Furthermore, the solar panels could not be used as the craft was at the far side of Mars, where it would not receive any solar light for 15 minutes, causing a dangerous shortage of power. The craft was therefore put into standby mode, with no possibility to communicate, flying on batteries that were originally not designed for this task. This Mars manouvre was therefore nicknamed "The Billion Dollar Gamble". Fortunately, the flyby was successful at 03:15 CET and the mission now continues. In May 2014, the Rosetta craft will enter a very slow orbit around the comet and gradually slow down in preparation for releasing a lander that will make contact with the comet itself. The lander, named "Philae", will approach 67P/Churyumov-Gerasimenko at relative speed around 1 m/s and on contact with the surface, two harpoons will be fired into the comet to prevent the lander from bouncing off. Additional drills are used to further secure the lander on the comet. Determination of the chemical compounds present. Study of comet activities and developments over time. The exact surface layout of the comet is currently unknown and the orbiter has been built to map this before detaching the lander. It is anticipated that a suitable landing site can be found, although few specific details exist regarding the surface. Mission timeline of Rosetta spacecraft. Computer model of Rosetta probe. First Earth fly-by (March 2005). February 25, 2007 Mars fly-by. November 13, 2007 Second Earth fly-by. September 5, 2008 - flyby of asteroid 2867 Šteins. Third Earth fly-by (November 2009). July 10, 2010 - flyby of asteroid 21 Lutetia. Deep-space hibernation (May 2011 - January 2014). Comet mapping / Characterisation (August 2014). Landing on the comet (November 2014). Escorting the comet around the Sun (November 2014 - December 2015). 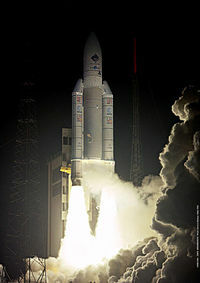 Ariane 5 Launch of Rosetta spacecraft. Instruments on board Rosetta spacecraft. ALICE (An Ultraviolet Imaging Spectrometer). The UV spectrometer should search for the abundance of noble gas in the comet core, from which the temperature during the comet creation could be estimated. The detection is done by an array of potassium bromide and caesium iodide photocathodes. The 3.1 kg instrument uses 2.9 Watt and was produced in the USA, and an improved version is used in the New Horizons..
OSIRIS (Optical, Spectroscopic, and Infrared Remote Imaging System). The camera system consisting of a narrow angle (700 mm) and a wide angle camera (140 mm), with an 2048x2048 pixel CCD chip each will take pictures of the comets. The instrument was constructed in Germany..
VIRTIS (Visible and Infrared Thermal Imaging Spectrometer). The Visible and IR spectrometer is able to make pictures of the core in the IR and also search for IR spectra of molecules in the coma. The detection is done by a mercury cadmium teluride array for IR and with a CCD chip for the Visible range. The instrument was produced in Italy, and improved versions were used for Dawn and Venus Express. MICRO (Microwave Instrument for the Rosetta Orbiter). With the microwave emissions the temperature and the abundance of volatile substances (like water, ammonia and carbondioxide) can be detected. The 30 cm Radio antenna was constructed in Germany, while the rest of the 18.5 kg instrument was provided by the USA. Rosetta spacecraft: Gas and Particles. ROSINA (Rosetta Orbiter Spectrometer for Ion and Neutral Analysis). The instrument consists a double focus magnetic mass spectrometer DFMS and a reflectron type time of flight mass spectrometer RTOF. The DFMS has a high resolution (can resolve N2 from CO) for molecules up to 300amu. The RTOF is highly sensitive for neutral molecules and for ions. MIDAS (Micro-Imaging Dust Analysis System). The high resolution atomic force microscope will investigate the dust particles which are deposited on a silicone plate. COSIMA (Cometary Secondary Ion Mass Analyser).Composition of dust particles is analysed, after the surface is cleand by indium ions, by secondary ion mass spectrometry. Ions up to a mass of 4000 amu is possible..
Major events and discoveries by Rosetta spacecraft. March 2 - ESA's Rosetta mission is successfully launched at 07:17 GMT (08:17 Central European Time). The launcher successfully placed its upper stage and payload into an eccentric coast orbit (200 x 4000 km). About two hours later, at 09:14 GMT, the upper stage ignited its own engine to reach an escape velocity in order to leave the Earth’s gravity field and enter heliocentric orbit. The Rosetta probe was released 18 minutes later. ESA’s Operations Centre (ESOC) in Darmstadt, Germany, established contact with the probe shortly after that. March 4 - Rosetta executed its first planned close flyby of Earth. The Moon and the Earth's magnetic field were used to test and calibrate the instruments on board of the spacecraft. The minimum altitude above the Earth's surface was about 1954.7 km at 22:09 UTC and images of the space probe passing by were captured by amateur astronomers. July 4 - Imaging instruments on board observed the collision between the comet Tempel 1 and the impactor of the Deep Impact mission. February 25 -- Mars swing-by. Philae's ROMAP (Rosetta Lander Magnetometer and Plasma Monitor) instrument measures the complex Martian magnetic environment, while Rosetta's OSIRIS (Optical, Spectroscopic, and Infrared Remote Imaging System) took various images of the planet using different photographic filters. While in Mars shadow most of the instruments were turned of the Philae lander was autonomous running on bateries. While this operation the ÇIVA instrument on the lander took pictures of Mars. Among others, both actions were meant to test the spacecraft's instuments whilst the probe needs the gravity of Mars to change directions in order to undertake its second Earth fly-by in November.